All clothes are not created equally. Different materials require different approaches. We know we’re supposed to separate most of our clothes, but are we washing them the right way? Rub the stain until it’s gone! The best tactic for treating stains before washing them is to be gentle and methodic. More detergent is better! The overuse of detergent can actually lock in dirt to certain materials rather than wash it out. ‘Dry Clean Only’ is a only a suggestion! More often than not, you may be able to wash some of these garments by hand and then air dry, but for the best cleaning, it is recommended to have it done professionally. Zippers and buttons don’t matter! Zippers should always be zipped entirely to avoid snagging on other clothes. Buttoned shirts, alternatively, should always be left undone; leaving them buttoned puts too much stress on the buttons and buttonholes leading to deterioration. Load up the washer to clean the most at once! 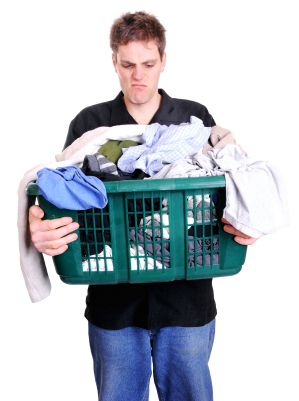 Filling a washer improperly, such as overloading, may result in lackluster cleaning as garments aren’t given enough room to move around evenly. Remember to pay close attention to specific washing instructions on your clothes and these common mistakes can be avoided.